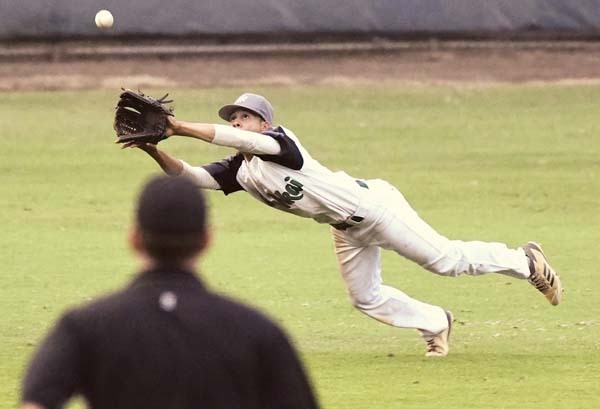 WAILUKU — Add another Maui Interscholastic League title to the Molokai High School baseball dynasty. The Farmers completed an unbeaten run to their sixth straight MIL Division II pennant on Friday night at Maehara Stadium with an 8-4 win over Seabury Hall. Shraedon Naeole-Starkey came on in relief on the mound and finished the game with 4 2/3 innings of work, surrendering three runs on just one hit — he walked one and struck out three. The Farmers (11-0) advance to the state tournament May 9-11 on Oahu. Seabury Hall finishes 7-4, with all four losses coming against Molokai. Molokai center fielder Cody-Hunter Hiro made four stellar catches for outs, including two to finish the Seabury sixth inning. “He just has my back, you know what I mean?” Naeole-Starkey said. The Farmers broke on top in the bottom of the second inning when Hiro singled home a run, stole second base, stole third and scored on a passed ball. The Spartans took a 3-2 lead in the top of the third. Jacob Luther hit an RBI single to center field and after runners reached second and third, and Kenny Belew sent a dribbler down the third-base line — Kapena Hoopai was out at the plate on a tag by third baseman Alika Balbas. Belew kept running to second base, drawing a throw from catcher Kaimana Nakayama, which allowed Luther to score after starting the play on second. Moments later, Parker Al­meida scampered home after an error on a ball hit by Ben Belew. The Farmers took the lead right back with three runs in the bottom of the third, starting the frame with four straight singles and scoring on RBI base hits by Naeole-Starkey and Kekaiomalu Adachi. Kenny Belew struck out the next two batters before uncorking a wild pitch to allow another run to score. Belew got out of further trouble with a ground out. The Farmers added two runs in the fifth — on a wild pitch and a Nakayama walk with the bases loaded. A sacrifice fly by Balbas accounted for the final Molokai run in the sixth, while the Spartans scored their final run on a wild pitch in the top of the seventh. Seabury Hall coach Joe McFarlin could only tip his hat to the champions. Kenny Belew, Ben Belew (5), Rafe Perrin (6) and Jack Almeida, Kenny Belew (5); Nainoa Kaahanui, Shraedon Naeole-Starkey (3) and Kaimana Nakayama. W–Kenny Belew. L–Naeole-Starkey. D-I overall championship, if necessary: Baldwin vs. Kamehameha Maui 5:30 p.m.